Introducing the next generation of be quiet!’s famous CPU cooler family: the Shadow Rock 2 premium CPU cooler. Building on the award-winning technology be quiet! is famous for, Shadow Rock 2 delivers exceptionally high cooling performance and remarkably quiet operations, all at a highly attractive price for the premium CPU cooler segment. Shadow Rock is designed for optimal cooling function and compatibility with all current Intel and AMD sockets. Whether your PC is built for advanced gaming, demanding graphics applications, or hi-res multimedia functionality, Shadow Rock 2 will impress you with its combination of features and price point. 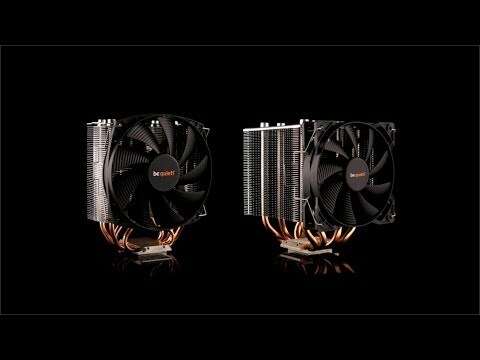 • Very high cooling benchmarks complement its high cooling capacity of 180W TDP. • Four high-performance 8mm heatpipes carry heat to optimal location on the cooling fins. • Turbulence-reducing wave design on cooling fins reduces noise generation from airflow. • Optimized 120mm be quiet! fan with PWM function supports the best balance of cooling performance and quiet operation. • Even at 100% PWM function, noise is at scant 25.4dB(A). • Square, single tower design saves space and supports four-directional fan mounting for best heat convection. • Compatibility with all current Intel and AMD sockets. • Freely-selectable fan mount point is recommended for AMD users. • Top cover with brushed aluminum finish. Features • Exceptionally high cooling benchmarks to complement its high cooling capacity of 180W TDP. • Turbulence-reducing wave design on cooling fins diminish noise generation and improves cooling performance. • Square, single tower layout saves space, supports four-directional fan mounting for best heat convection. • Four 8mm heatpipes carry heat to optimal location on the cooling fins. • Top cover with aluminum brushed finish. • German product conception, design and quality control. be quiet! Shadow Rock 2 Single Tower CPU Cooler, 4 Heatpipes, 1x120mm Silence-Optimised PWM Fan, 180W TDP, for Intel/AMD is rated 4.0 out of 5 by 1. Rated 4 out of 5 by OHIC from Good, but insanely large I bought this cooler and my new motherboard at the same time, and putting them together made me very glad that my RAM is low profile! My CPU and mobo combination is an LGA1150 with MicroATX, but I think the situation would be pretty much the same with any full ATX too: do not pair this cooler with any of the spectacular Klingon-looking RAM types with tall headspreaders. You simply will not be able to insert all of the sticks, since the heatsink will cover one and possibly more slots (check reviews for photos of what I mean). This cooler overhangs all of my RAM sticks, with only just enough clearance to allow the sticks to be manoeuvred into position at an angle, since I had to remount the fan pointing into the case (else it would have collided with the card or been too close to the ceiling). That said, the cooler is impressive. The fan is as quiet as they come, and you'll have to look at it to know it's spinning. I suspect the gigantic heatsink does most of the work though. You should also Google for reviews if you intend to overlock. I've paired this with an i5 4440, so it will never be overclocked, but various reviews have expressed disappointment with its cooling in a heavily overclocked computer. For overclocks, Be Quiet! 's Dark Rock Pro 2 is said to be a better performer, but at stock speed this one's fine. Does this come with the required apparatus to mount a second fan? This cooler is sold as a single fan cooler so does not include the clips to mount a second fan. Does it support AM4 socket?